Just days after the first Pixel 3 XL cases leaked online confirming certain design features, yet another bunch of them have surfaced today detailing even more areas of the flagship smartphone’s looks. Starting over on the rear, one of the case renders confirms that the dual-tone rear panel, which has been present on every Pixel smartphone since the original series, will once again be making a return. However, in a move that will seemingly permit wireless charging support, the aluminum portion has been swapped out for a new frosted glass section that sits on top of the regular glass panel. Additionally, it appears the rear camera sensor is surrounded by a new accented silver strip. While on the topic of the camera, these new case renders also reconfirm the presence of a dual-tone LED flash which sits to the right of the camera sensor. Moreover, the rear fingerprint scanner will also be making a return. Taking a peek at the front design, the rather large bottom chin is rather difficult to miss, just like the notch that sits above the display. Nevertheless, it’s worth pointing out that both bezels include front-facing speakers, thus permitting a stereo speaker setup, and the notch is also home to two front-facing cameras which will presumably improve bokeh images. On one final design note, the right side of the frame features a volume rocker and a power button. Currently, Google’s Pixel 3 XL is expected to become official on October 4 alongside the smaller Pixel 3, with sales presumably commencing roughly two weeks later. 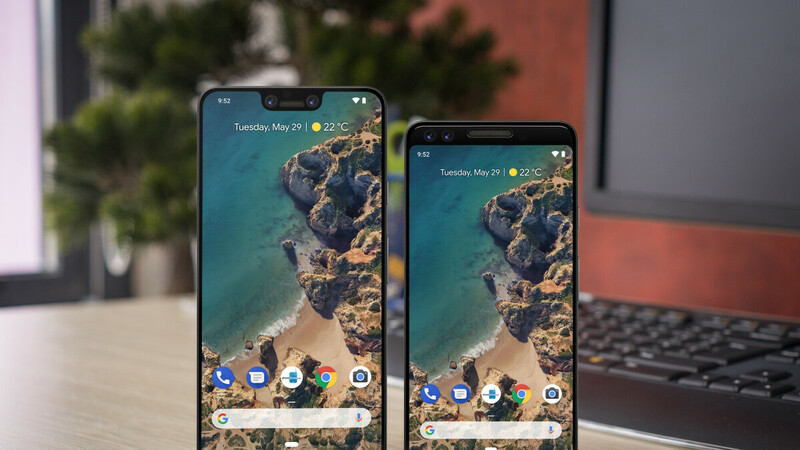 Internally, both smartphones are expected to be identical but, on the external side of things, the smaller Pixel 3 is set to include a more traditional 18:9 display rather than a notched equivalent like the larger offering. XL still to big cant wait for more details about the camera on the Pixel 3, my Samsung s7 edge keeps overheating & rebooting since Oreo update, need a new phone. the Pixel 2 and 2 XL have one of the best cameras currently on the market, and the Pixel 3 will more than likely improve it. If the camera is your focus it'll very much be an upgrade. Do these renders have the ugly notch which most people in this website hate? I wonder what all the fanboys would say :). Jokes aside very excited to see the amazing new camera in the pixel. I wish Apple will make their camera as good as these guys. Not really sure I count as some fan boy, but the notch is the reason I do not care for Pixel 3 at all. Excited about the Pixel 3(vanilla). Hope they fix all the quality control issues with this phone. I have a note 8 but I will get a Pixel 3 !! Stock android !! Yeah babyyyy !! I'm digging the XL I like the dual FFC on the sides of the earpiece. Not a big fan of that chin though not sure why they stole it from Sony . They have front facing speakers ; just like pixel 2. They didn't stole anything. It was a joke because Sony is known for the huge bezel design.